Can you use your body to learn English? Today, Lindsay chats with Jessica Coyle about some of the ways the art of improvisational technique can help you use your body to improve your English! How do you build a “Brain Box” for the IELTS Listening Exam? Today Lindsay and Jessica talk about two strategies to make the listening part of the IELTS exam easier! Do you have trouble understanding American speech habits? In today’s Tear Up Your Textbook Tuesday, Lindsay and Michelle discuss 5 weird ways Americans use English, and how to understand what they’re saying! What’s so difficult about the IELTS Speaking Part 1? Today, Lindsay and Jessica discuss some tactics for avoiding the dangers and allowing yourself to stand out! Speaking Part 1 of the IELTS includes questions about yourself. You will be asked about three topics, and though it may seem like simple stuff, the danger is that you might become too relaxed and start using one-word answers. You want to do better than that. In fact, ideally your answers will be 2-4 sentences each! How can you do come up with that? Do some brainstorming. Think of the question words. Question words can help you think of better answers. Vocabulary is also important in Speaking Part 1. If you want to achieve a higher score, you will need to use a range of vocabulary, including slang and idioms. The examiner wants to hear that you know more than what’s in your textbook. A good strategy is to have a short list of slang and idioms ready to use. What are some good English slang words or idioms that might be helpful to have for Speaking Part 1 of the IELTS test? AEE 244: To "Do" or to "Don't"- That Is the Question! Do you prioritize learning English? Today, Lindsay and Michelle talk about the famous “to do” list, and whether or not it really moves you forward in your life or your career! How do you persist in learning English? Do you expect it to ever get easier? Today, learn how a New York-based painter went from poverty to riches by sticking with it, and how you can achieve success by following his example! Can movies cause problems in speaking natural English? Today, find out why mimicking phrases from movies can make it difficult to have natural-sounding English conversations! Hollywood is drama. Its stories are fiction. This means that the language used by characters is often unrealistic. Because of the unnatural dialogue, you don’t want to quote from movies unless it’s understood that you are quoting. Native English speakers do it all the time by slightly changing the tone of their voice. Even then, such quotes are usually made in a context that makes it clear that the usage is a little joke. While it can be fun to directly quote movies, you want to try to sound more like a real English speaker, not a fictional character. Do you have any favorite movie quotes in English? Share the ones you love in the comments section below! Do you need a plan for Writing Task 1 on the IELTS exam? Today, Lindsay and Jessica share two clear steps for helping you beat it! The IELTS exam’s written section is divided into two tasks. Task 1 requires you to interpret a map or chart in approximately 150 words, while Task 2 is about 250 words on your own thoughts. Even though it is longer, Task 2 is often easier for test-takers. Task 1, because of the vocabulary needed, can be much more difficult. The Task 1 chart is usually some kind of line or graph that shows a change over time. To give yourself the language needed to discuss this chart, a good tactic might be to read the business section of the newspaper and pick up the vocabulary you need – words like that describe change, like increase, decrease, decline and skyrocket. In writing your answer for Task 1, keep it clear and simple. A good plan might be to discuss increases in paragraph one, and decreases in paragraph two. That way, your answer is organized. How are you preparing for the IELTS exam’s Task 1? AEE 241: Could You Listen? Would You Listen? You Should Listen! Do you have trouble using English modals? Today, Lindsay and Michelle give you three crazy role-plays to understand when to use should, could and would! Correct use of modals like should, could and would can be confusing. All three deal with time and possibility, and all three involve telling or asking someone to do something. Should describes the strong possible likelihood of something. It is also used to give advice. Could describes a possibility in the past or the future. It can also be used as a polite request. Would is most commonly used to make a polite request. How can you use should, could and would? Give us some examples in the comments section below! Are you preparing to take the IELTS exam? Today, Lindsay and Jessica discuss what you need to know to pass with the score you want! Do you have trouble writing an email in English? Do you worry about what kind of impression you’re making? Today, Lindsay and Michelle share four common email mistakes made by non-native English speakers, and how to correct them! Have you ever thought about taking the TOEIC? On today’s Test Talk, Lindsay and Jessica talk about using prediction in testing, and how it can help! When getting a bank account, cell phone, or internet connection in a foreign country, you need to be able to ask questions and know the right structures of conversation. If you don’t, you might not be told all of the information you need to know. By practicing, especially if you’re able to do so with a partner, you can learn to anticipate what might be said by the other person. Doing this is learning to predict, and see what you’re missing. It might make you a better test-taker. If you would like to learn about this strategy, hear advice on how to strengthen it with resources that are free online, and get a practice guide written by Jessica, purchase the full episode. Are you taking the TOEIC-1? If so, let us know in the comments section below! On today’s Deep Thoughts Thursday, Lindsay and Michelle consider a quote from Teddy Roosevelt, 26th President of the United States. AEE Test Talk: Meet the Examiner of Excellence! Are you thinking about testing in English? Today, Lindsay introduces Jessica, the Examiner of Excellence, who’s here to help you excel at your English tests! Test preparation doesn’t have to be boring. In fact, it should be interesting. When you’re studying for an English test, it isn’t the same as studying for a math test. You need to activate your emotions so you can remember more. Reading or watching movies in English can help, but you can also practice writing essays on subjects that are interesting to you, or go out and speak English with native speakers. Think of it as test preparation. Be proactive. Take an active approach that involves your brain. Try to think about and predict answers. Trust yourself. Don’t start doubting yourself when answering questions. Often, your first answer is the correct one. Follow directions. Tests are written by smart people. Don’t start looking ahead and trying to race the clock. If you do, you might miss an important instruction. Don’t rush. Don’t worry about timing. Instead, focus on your English and do what the test asks you to do. Have you done any testing in English? Are you sometimes unsure what to do next in life and with your English learning? Today Lindsay and Michelle talk about how to proceed when life feels overwhelming! Do you ever need to comfort others in English? On today’s Tear Up Your Textbook Tuesday, Lindsay and Michelle teach you a simple trick for boosting egos and helping others see the brighter sad of unhappy situations! Do you have an information addiction? Today, Lindsay and Michelle will have a natural English conversation about how information addiction can affect your life, and what you can do to unplug! AEE 235: When Opportunity Knocks What Do You Do? Do you know when to take advantage of an opportunity? On today’s Deep Thoughts Thursday, Lindsay and Michelle talk about the biggest decisions in life, and how to make them! The suggestion is, if opportunities in life do simply come to you, then you should go out and look for opportunities yourself. But which ones should you pursue, and which should you let go? The worst would be to not explore an opportunity that attracts you, and then have regrets about it later. Sometimes you’re afraid, and sometimes others get in the way of opportunities. Life’s short, so don’t let that happen! Find a quiet place to think about opportunities when you encounter them so you don’t pass up something good. Have you had to make your own opportunities? Are you nervous about speaking English? Are you looking for a way around it? Today, Lindsay and Michelle share a story about one student who overcame his fear of speaking English by being an expert at something else! An English student in an American business course had little confidence in his English abilities. But when the other students in his course discovered that he understood their subject better than any of them, he was asked to be their tutor. Of course, they wanted him to tutor them in English. This turned out much better than expected. As a tutor, he had to be in the moment and focused. He couldn’t worry about his inhibitions or nervousness, or making mistakes. And because of this, he was able to take control. Are you looking for a professional, native English teacher online? Get a native English teacher online in seconds at italki. We recommend italki as our #1 English-learning solution online. Choose from more than 400 teachers to work on your business English or to pass your next big exam. Get our special offer before it runs out! Go to italki and claim 10USD to go toward a FREE English lesson! A classroom is a safe place to learn English, but you are expected not to make mistakes, and so you must focus on your own perfection rather than connection. Connecting with others is more natural. Try to get out of the classroom and overcome your inhibitions. How do you practice English outside the classroom? Does it help make you less self-conscious about speaking English? Need some help talking about your plans in English? On today’s Tear Up Your Textbook Tuesday, Lindsay and Michelle tell you how to talk about the future the way native speakers do! Usually English textbooks tell you to talk about the future using ‘will’ and ‘going to’. These work, but native English speakers also do it by using the progressive tense. To native ears, this is a more natural and conversational way to talk. Are You Ready to Practice? Get a Private, Native English Teacher Now! Try italki to learn to speak like a native. You’ll get your English mistakes corrected immediately! For a limited time you’ll get 10UD to use towards private English lessons on italki. Visit italki now to claim your 10USD in free English lessons. Note that all of these conversations are talking about the future, not the immediate moment. Do you want to get a job in the US? Today, Lindsay and Michelle discuss what you need to know to excel at an American job interview! Job interviews everywhere focus on skills and training. But in the US, employers are usually interested in character as well. They want to know whether you’re a team player, what your potential is to be a leader, and how you will grow in your job. As such, they might ask some questions focused more on your behaviors than your skills. It would help to think about these questions ahead of time, so you can be prepared. “Tell us about the most difficult/frustrating individual you ever had to work with, and how you managed to work with them.” By asking this, they’re seeing whether you can rise above a problem and keep it from affecting the company. “Give an example of how you’ve broken out of a routine or when you’ve successfully developed a new approach.” Here they’re asking you to show flexibility. “How do you schedule your time/prioritize time when you have a tight turnaround?” With this, you might want to explain how you ask others for help or delegate your work. In answering all of these questions, try to tell a story from conflict to resolution, and keep it under three minutes if possible. Do employers ask questions like these during job interviews in your country? Brad received his undergraduate degree at New York University in 1984, and spent the next 15 years in the business world focused on sales and marketing. After spending a year testing the English teaching waters in Korea, he returned to the USA and got a Masters degree in TESOL from Seattle University in March 2001. Since then Brad has worked in London for a summer, spent a few years in Ireland writing TEFL materials for the Wall Street Institute and other companies, and has worked in Germany and Austria as an in-house Business English trainer for companies like Siemens, Deutsche Post/DHL and EADS. He has also taught many seminars and workshops for various companies on skills like presentations and business correspondence, as well as a business course for two years at the University of Ulm, Germany. 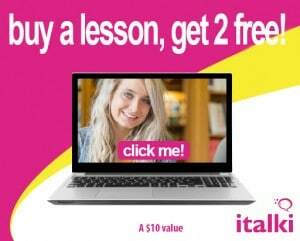 Step 1- Go to italki to get $10 off your second lesson. You must use this link to get the special deal. Step 2- Search for “Brad C” in the teacher search bar after you have registered with the above link for our special promotion. Do you ever take a risk when learning English? Or would you rather be ordinary and routine? Today, Lindsay and Michelle discuss how not being a play-it-safer can help your English grow! Do you want some help with the local English in San Francisco? Today, San Francisco native Sarah Honour talks about how you can go local with your English in the City by the Bay! San Francisco is one of the most unique and amazing cities in the United States. It’s residents are technology-centric due to their proximity to Silicon Valley, as well as health-centric and nature-centric due to the progressive philosophy that has long been part of the spirit of the city. Sarah believes that these traits are found in some of the language that San Franciscans use, and that knowing this terminology can help you fit in just a little better. “Is there an app for that?”: App is short for application, as in for your phone. Because the Bay Area is near the center of a major technological development region, there are apps for almost everything in the city — from calling a taxi to getting your groceries delivered. Organic, Local, Sustainable and Seasonal: Food quality is really important to San Franciscans. Organic means that no pesticides have been used, local means the food was grown nearby, and sustainable means the environment was not harmed to produce it. Seasonal simply means that it is the natural time of year for the food to grow. “Where’s the wiggle?”: San Francisco is a great city for biking, but it is also a city with lots of hills. The ‘wiggle’ is the route for biking with the least amount of hills to go up. Tell us why in the comments section below! Sarah is a 31 year old American who was born and raised in Denver, Colorado, studied Communications in Seattle, Washington, and worked for almost 10 years as a nanny (or babysitter) in San Francisco, California. She now splits her time between San Francisco and Sardinia, Italy where her boyfriend lives. She is an English teacher on italki, and is learning Italian and sampling as much of the amazing food and wine from Italy as she can. How do you clarify information in English? Have you ever met someone on the phone or the internet before you met them in person? Today, Lindsay and Michelle discuss tag questions, and how they can help you confirm what you think you know, but aren’t sure about! A tag question helps you to confirm a piece of information that you think is true, but that you want to clarify. Though they are used as a tool for clarity, they can also be a great way to create conversations. Tag questions tend to begin with the statement to be clarified, and then end with the question. There are many possible combinations. Do you ever use tag questions? What kinds of things do you need to confirm or clarify in others? Do you want to start a conversation in English? Today, Lindsay introduces and talks about conversations with Michelle Kaplan, the new All Ears English co-host! Michelle was born in Washington DC but now lives in New York City. She’s musical, likes basketball, and has some unusual tastes in food. Most importantly, she’s the new All Ears English co-host. In her premier episode, Michelle talks with Lindsay and offers some simple conversation starters in English. Can’t find native speakers to practice English with you? Can’t get your English corrected by your native-speaking friends? Get a professional, native English teacher in seconds at italki. For a limited time, italki is offering 10 USD in free English lessons. Click here to get your 10USD in italki credits before this offer runs out! Where are you from (originally)? Is your family still there? Do you visit them often? Do you have any other conversation starters?